Cabinet photograph of four children with identification on the reverse: Ned Nute family. The photograph was taken at the Gay studio at Fall River, Massachusetts. It's possible that the surname is Nutt, rather than Nute. The 1900 Federal Census of Fall River, Massachusetts, lists a Joseph E. Nute, born about September 1863; wife Harriet and several children. 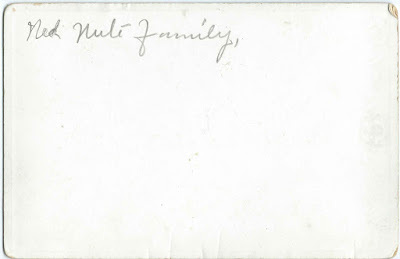 He was Joseph Edson Nute, born about 1863 at Woodstock, Maine, son of Orsamus and Lavinia D. Nute. Joseph was manager of the Fall River Gas Works Company. There are records showing him as Joseph Edson Nute, Sr., though I haven't found a record of Joseph Edson Nute, Jr.
Joseph's Massachusetts marriage record indicates that he, an engineer, and Harriet Gove Wilkins, a teacher, married on May 30, 1887 at Boston, Massachusetts. Harriet was born April 18, 1864 at Boston, Massachusetts, daughter of Charles W. and Lydia H. (Gove) Wilkins. 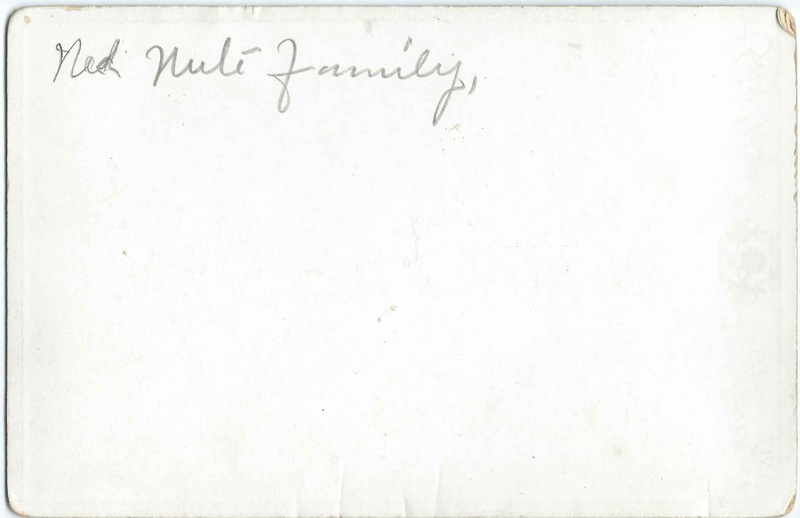 Read more about Joseph Edson Nute, Harriet Gove (Wilkins) Nute and their children in this interesting blog post. It mentions five children, Helen, born in New Jersey, and Raymond, Alden, Warren and Katherine, all born at Fall River, Massachusetts. 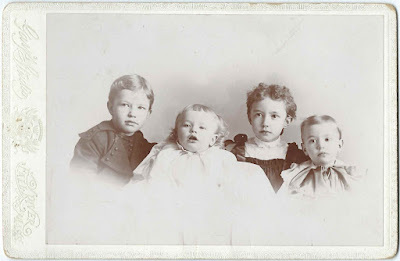 Perhaps the four older children are the children in the photograph above. The biography below doesn't mention daughter Catherine, who was born in 1899, no doubt after that book went to the printer. Read a short biography of Joseph Edson Nute from Our Country and Its People: A Descriptive and Biographical Record of Bristol County, Massachusetts, Part 2, by Alanson Borden, and published in 1899. Joseph Edson Nute died in 1949. If you have corrections and/or additions to the information above, or an alternative theory as to the identity of the Ned Nute family, please leave a comment or contact me directly.